I get asked a lot of questions about how I make my signs, so I thought I would re-publish this tutorial that I had posted a few months ago. If you want to make a sign for yourself, I hope this helps! 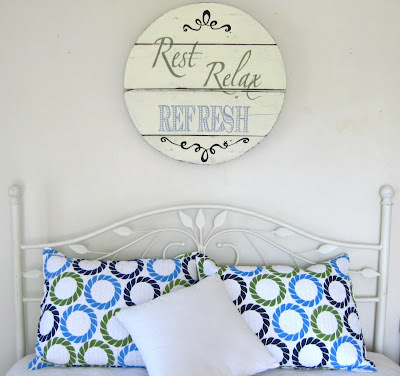 Here is a tuturial on how I make my wood signs and how you can too! I hope this will be helpful if you're not sure what steps to take and products to use. Disclaimer: This is just my made-up way of doing things. I've never taken a class in painting and certainly am not a professional! I'm sure there are better ways of doing things, but this is what I've found works for me. Step 1: Find a piece of wood to use. 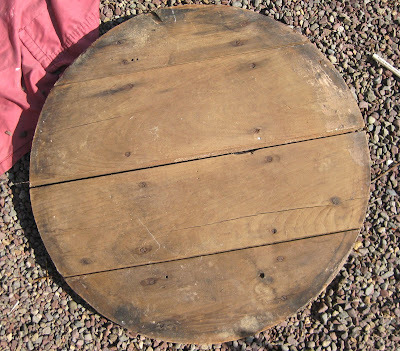 I've found wood at barn sales, yard sales, in our attic, from leftover projects...wherever! Just make sure it's in good condition and not rotting. I have my husband cut the wood to size if needed. 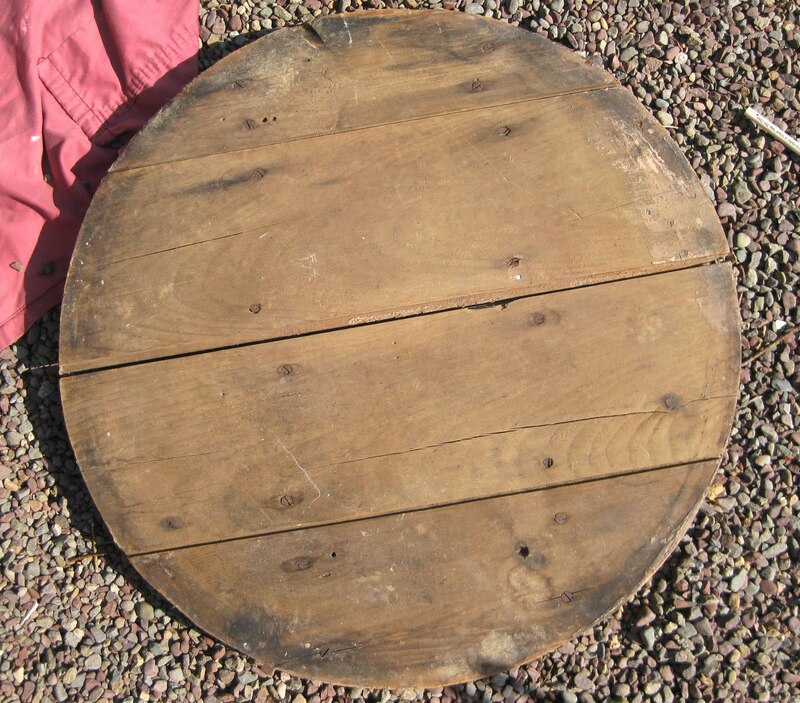 I found this particular round wood piece (I think it was the top to a child-size picnic table) at a barn sale. I loved the shape and knew I could do something with it. 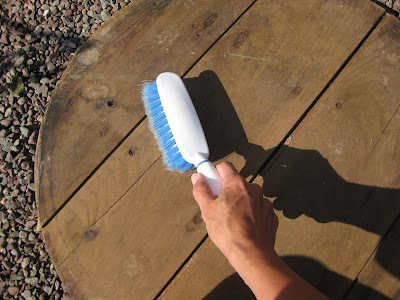 Step 2: Clean the wood with a brush or rag. Step 3: Paint primer onto the wood. I am in LOVE with B-I-N primer. It covers the wood really well and dries in about 15 minutes. You can get it in a gallon, a quart, or as a spray paint. If your paint is going to be a dark color, you can ask the paint store to darken the primer, so that your paint covers the surface better. 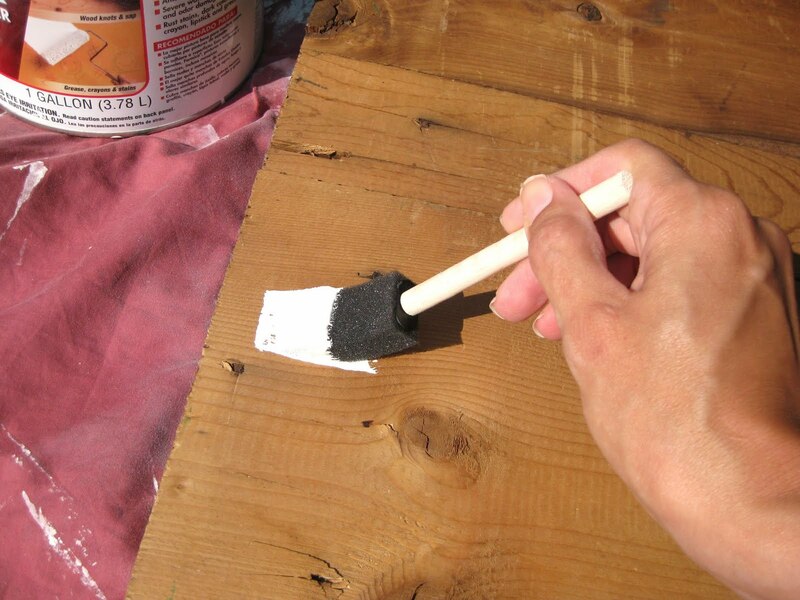 Use a foam brush to paint the primer onto the wood. Since B-I-N primer is not water-based, I use a disposable brush so that I can just throw it away instead of needing to clean the brush. You can find these inexpensive foam brushes at Walmart, craft stores, or paint stores. They cost about 25 cents or less. Here is the wood covered with primer and ready for paint. I often find cheap semi-gloss paint in the "as is" section of the paint/home improvement store. The paint is perfectly fine, but for whatever reason, the store mixed it incorrectly or the customer didn't like the color, so the store will try to sell it already mixed at a low price. I usually need to brush two coats of paint on. You can use a paint brush like I did (below) or a small paint roller. Step 6: Arrange the words onto the wood exactly where you want them to be painted. You can use a ruler to make sure the words are straight and positioned correctly. Use scotch tape to tape the paper onto the sign. Step 7: Put carbon paper under the printer paper and trace the lettering onto the wood with a pen. 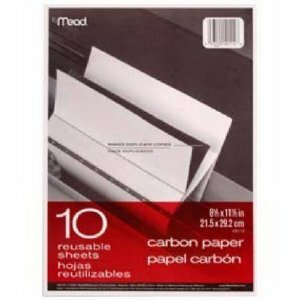 I use this type of carbon paper, which you can buy at bookstores or at Amazon.com. And, by the way, you can re-use the carbon paper over and over again. You don't need to use a fresh sheet each time you trace something. Edited to add: If you are painting onto a dark background, you can also find white graphite paper (similar to carbon paper) that will trace a white line instead of black. Step 8: Using a tiny paint brush and acrylic craft paint, fill in the lettering that you just traced. Most times I do two coats of paint for the lettering. You can buy small bottles of craft paint at Walmart or craft stores for around $1. You can also use paint pens, which are great for small letters and details. However, they mostly just come in primary colors, so I don't use them a lot. 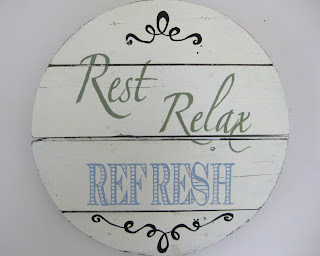 If I want the sign to look rustic, I will use sandpaper to sand the edges and lightly sand the lettering to make it look a bit worn. Edited to add: paint pens also work great if you aren't comfortable with using a paint brush. You can find them at most craft stores or even Walmart. And there you have it! You are finished! This sign is actually going to be hung on a porch wall at a friend's house. If you have any questions, please let me know and I'll be happy to answer them! You do such a great job! I might try doing a sign someday but they are intimidating. I did lot of review about wood working plan and I found one of the best website, I am using for my wood working, it contains all woodworking plans include workbench plans, shed plans, chair ... WOODPRIX has the best handbooks and ready instructions. Aimee, thank you so much for sharing a tutorial! I have been wanting to make a sign but had no idea where to start. Graphite Paper might work better! It's like carbon paper only with pencil (graphite) on the back! It's lighter & no chance of streaking your paint color! You can buy it at any Office Supply Store... or simply make your own with a pencil & a piece of copy paper! Aimee, I've been admiring your signs for ages and wondered what your method was! Thanks for sharing this tutorial for us all. You do such a beautiful job. Thanks, Aimee. I've recently used the BIN Primer on my first little project, on your advice, and I too was delighted. Thanks so much for sharing! You make it look so easy! I just found you via Pinterest! Yay Pinterest! This sign is just darling! Thank so much for the tutorial. I plan to give it a try! Thank you so much for sharing. I was looking for a wooden sign project that did not include one of those fancy, expensive Circut type machines! Thanks again....now off to buy some carbon paper and rip some wood off the side of the house! I have a sign in mind that I want to make, and your tutorial is incredibly helpful! I'm just not sure where to find the wood. I went to a local antique/thrift store today and didn't find anything. I checked craigslist. I just posted on freecycle. We live in a community where there are still some farms and I'm hoping one of them has something. I'm even going to ask the farmer whose field is behind my house. I know you said garage sales and barn sales, but it is the dead of winter here, and no one has that going on. I love the one on doors that you did. What kind of doors are those? Hey! I didn't see a lot of comments from guys so I figured I'd put my 2cents in. Heck your sign presentation was the next best thing since sliced bread! I enjoyed it along with the other input. 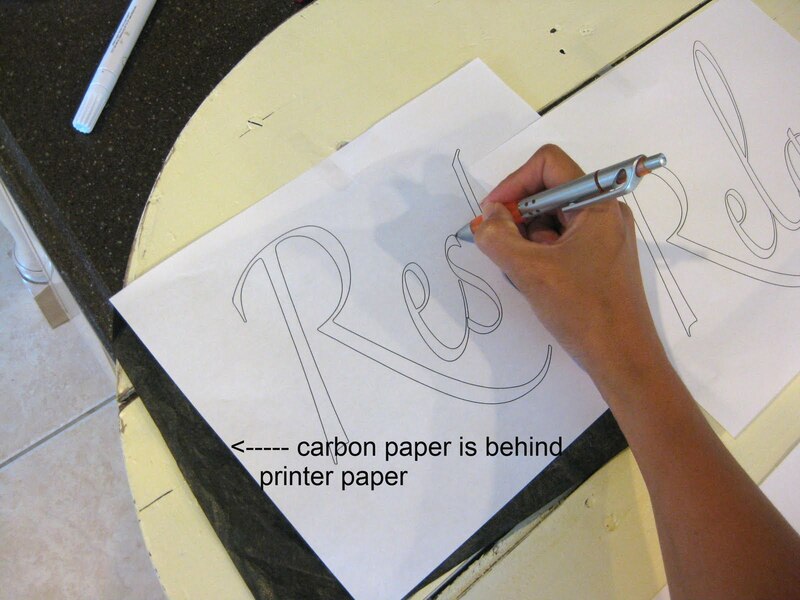 Haven't heard of using carbon paper since I was a kid! Long time ago. LOL! Thank you so much for sharing! I have a (probably) very lame question! I went to Ecuyer Dax to scour different fonts, chose one I liked and downloaded it, BUT it just printed the whole alphabet instead of my "saying". So now I am thinking I will have to take it to a print shop to blow up my lettering.....did I do something wrong?!?! Love this, Aimee. Found you on Pinterest. Thank you for posting this "how-to". I have so many scriptures I want to post around my home. thanks for the great tutorial!! I plan to try this some day! 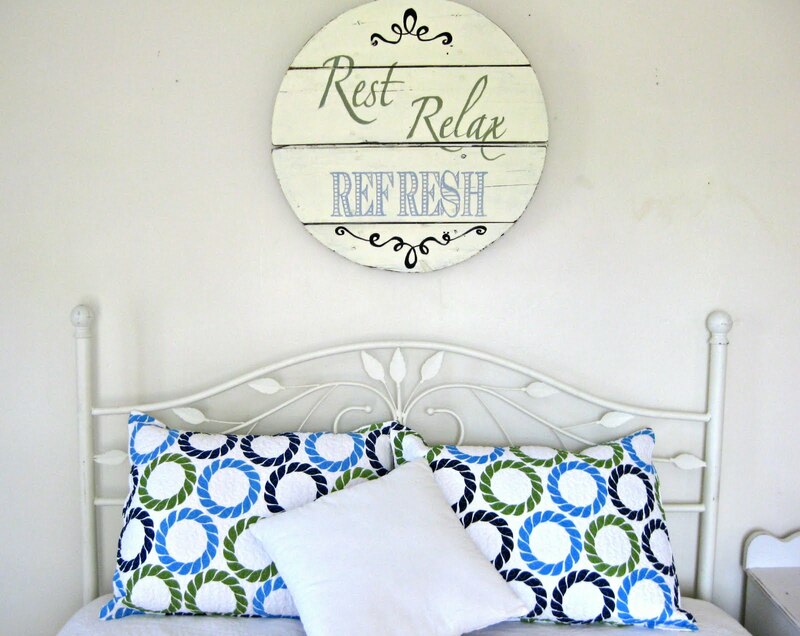 Do you use the Silhouette Cameo to make your signs? Or do you free hand? They're gorgeous! 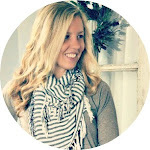 Thank you so much for sharing this..I found your blog from the Freckled Laundry blog. Hi! Love the tutorial. What is your method for wood that you dontt want to paint? I have some wood I want to keep natural but I want to add lettering... do you ever use polyurethane to seal? Thanks!! You may be my new best friend! I love this tutorial and can't wait to try it to make verses for my children! Thank you so much! What type of small brush do you use?? I made a few signs recently and really had trouble with straight lines. I am sure practice is the main thing I need, but wondered if I was using the right type of brush. Thanks if you have time to reply. The brush I use most is a #2 Round 7000 (bought at Michaels). It does take practice to make straight lines, and I've found that paint pens help with this as well, if you aren't comfortable with a brush. Let me know if you have any other questions! Also, you find the BEST belts at the thrift store! If you are looking for a hardier wood select redwood, cedar or cypress. 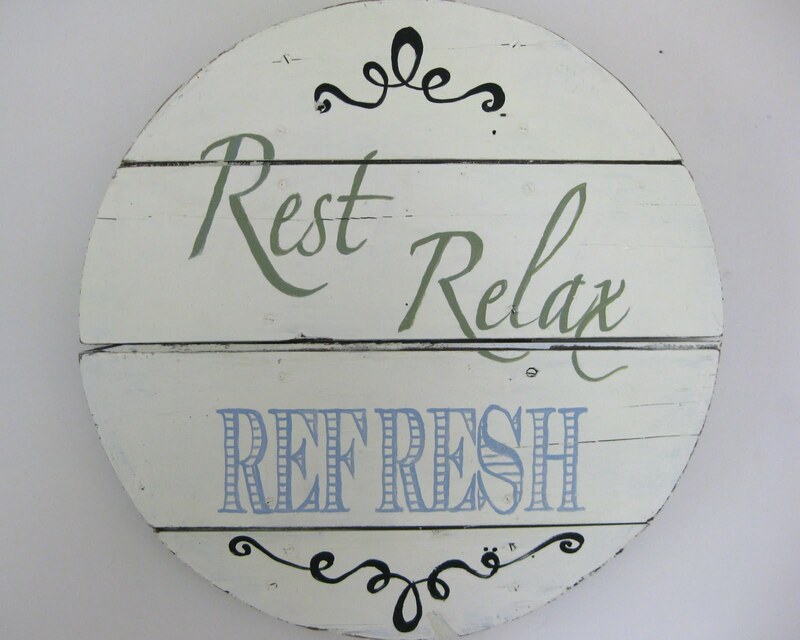 Excellent wood choices for indoor signs include cherry, walnut, ash and maple. I am soooooo excited to make some signs now, I like others wondered how the beautiful fonts were on sign and now I know, thank you so much!!!! Hi! I've been following your work for quite some time now. But there's one issue I've had that I've never seen addressed (But I dont read every comment and reply so I'm really sorry if it's already been adressed.) Ok, so I've tried to do a couple of signs and the carbon ends up getting all over the sign!! It seems like everywhere I put my hand or fingers it makes smears/smudges of carbon on the wood! Then it's just ruined! How do you prevent that from happening? I know that it just seems logical to not put your hand down...but tracing something while trying to keep BOTH hands completely off the paper is HARD! LOL! HELP!! Thank you for answering, and so quickly!! :-)I used the carbon paper last night after sending the msg. I am working on a rather large piece so I was able to just put my fingers where the letters were going to be...like inside of the letters. It worked great. It was a little tougher when I go to the smaller letters. I just tried to keep my hands up off the paper! lol I looked pretty funny! lol. Needless to say I'll be going to buy the art eraser today! Thanks Aimee! I LOVE your work! dark colored graphite paper works just like carbon paper with no mess and you can reuse also. Hey all, Another great trick to remember is to just take a pencil and rub it on the back of the letters. Hold the paper up to a window or light occasionally, and just rub pencil all over the area you're going to transfer. If you run out of carbon paper, or if you're doing something really small, this works great. I use carbon paper, but sometimes don't have it with me. 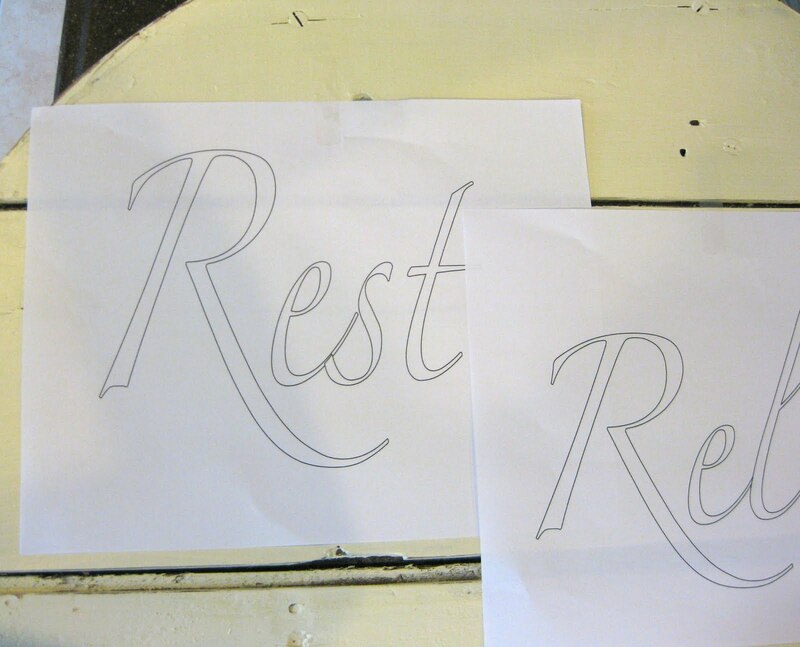 If you trace over the original lettering with a ball point pen, it works great. The pencil transfer is faint, and easy to remove. I never get smudges this way. I've been at other's homes, and shown them this trick (have no carbon paper). Someone asked about Polyurethane....it yellows, keep that in mind. I once made a sign with white letters on dark bkgrd, and didn't like the way it yellowed with Polyurethane. (Right away, letters became beigey, yellowy). Acrylic Varnish won't yellow, stays clear. 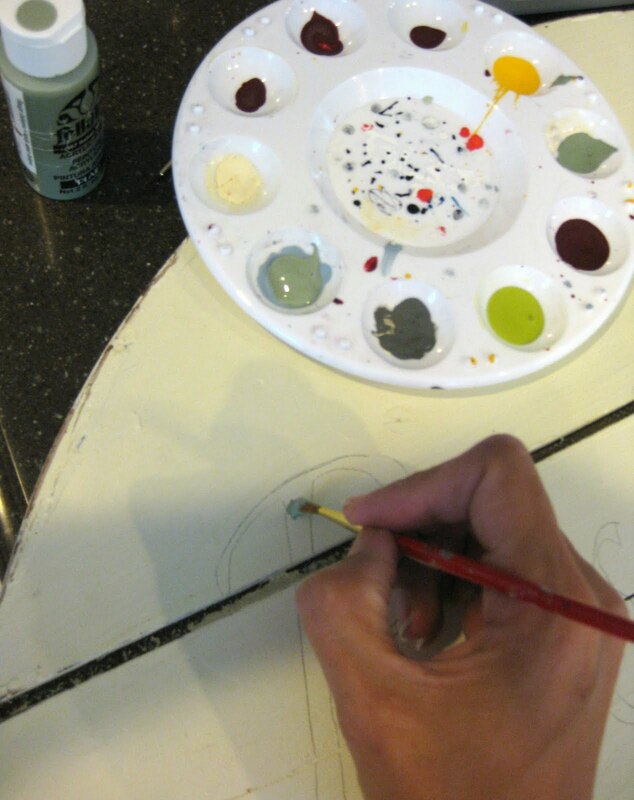 Generally you can tell a difference in your product by this: Acrylic (waterbased) are usually milky and whitish. Polyurethanes (oil-based) are usually clear, slightly amber if they're old. You can use either one outdoors, but both may need a re-coat every year or so. 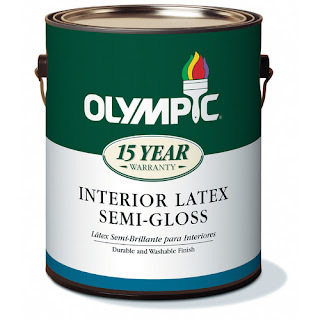 Use a very good outdoor latex for the paint coat! I've had a beach house sign up for 16 years, I used Weatherbeater paint at Lowe's and covered with Acrylic Varnish. It's looking weathered now, but all still intact. Your best bet outdoors is to ask for a 25 year paint!! They last much longer, it's a newer product. I do wall words for my business this same way. I actually like using the pattern transfer paper that you use for sewing! The stuff I have came from Walmart, I think, and it comes in several colors in one package, pink, blue,yellow, white... I haven't had a problem with this marking up other areas of my artwork as much as with regular carbon paper. Another suggestion I had for keeping things cheap and speeding up production a bit involves the brushes for primer. I also hate cleaning brushes after using oil-based paint, so I hit the Dollar Tree! They often have packages of cheap paint brushes in the home improvement section, so you can get like 3 for $1! Not as cheap as foam, but they are wide, and they apply paint great! Thanks for the tutorial - you made a lot of women's days! I'm a graphic designer and here are some tips. The computer doesn't necessarily space letters well, so I often adjust them. Just step back and look, and adjust spacing....cut paper apart and tape in place. Also, rounded-bottom letters (a,o,b,d,e,u)---the round part should go a TEENY bit below the line of the straight bottom letters (l,h,i,n). That round curve on each letter should sink just SLIGHTLY below the straight line that would go under the straight letters, if you were to draw a line. This is really nit-picky and only needed, probably, on a really big sign. SOME fonts adjust for this, some don't. The reason for this is, the rounded letters would appear to float upward if the bottom of the curve touched the "line." This same principle is in effect with this really good-to-know rule: Always leave slightly more space on the bottom. If you place some type in a square, and leave 2" on each side....then also leave 2" on the top, but leave 2.25 or 2.5" on the bottom. If you made it all even, the "object" cenetered in the box will appear to fall slightly, and look like you measured wrong. This rule is so helpful in so many places....always leave a little more air space on the bottom....Even when matting photographs, etc. This is hands down the best tutorial I've seen for this project. You are such a sweetie for sharing with us. I have one suggestion, for anyone who has Microsoft publisher or any other kind of related software, you can create the banner to the size you need and arrange it exactly like you want it in the software, print in out and then trace onto your wood. This is a pretty basic question, but when you print your letters from MS word..how do you print them in just outline and not filled in? I'm using quite alot of ink and would like to do it as you have pictured. Thanks for an amazing tutorial! If you go to the font box in MS Word, there should be an "Effects" list with "strikethrough", "shadow" and "emboss", etc. Click on "outline" and it should change your lettering to outline. Hope this helps! You can also print in a light gray, a light percentage, etc. I do that to save ink. Thanks for sharing! Your awesome! Love the tutorial! My question is "Will rain damage the sign? If you use an outdoor paint along with a water-based Polycrylic protective finish, it should hold up well outdoors. Love your page! What is the process to have a more "distressed" look? I typically use sandpaper to distress the edges. Sometimes I'll rub the edges and cracks with a stain as well. What grit number of sandpaper do you use? Great instructions I have been making signs for years and it's exactly what I do! I do have a great program for my computer that I've had for years called Print Master Gold it has a banner maker where I print out most everything! It's an old program and they have newer versions. It's a great program and much easier to use than MS word. I hope you check it out! I love your work!! Thank you so much for sharing your tutorial! I love your quotes & sayings...beautiful! I adore your blog! I do have one question... What size font did you use in Word and how do you get the words large on one sheet of paper? Hi Lisa! It was over a year ago that I made that particular sign and I don't remember what size font I used. To do the lettering, I use Word and most recently Publisher. I insert a "Wordart" into my document, choose the "outline" option, then you type in the words you want and you can choose the font. After the "wordart" is in your document, you can easily adjust the size. Hope this helps! Let me know if you have any other questions! Had my husband make me a 3' by 4' wood sign. It's painted and ready for me to add the wording. I've decided to do the fruits of the spirit. So fun! Love your blog & work! My sister just introduced me to your work. I have a question about the hanging hardware. What type do you use? Any good suggestions for adding hardware? Thanks!! I use heavy-gauge picture-hanging wire and large screws to fasten the wire onto the back of the signs. Where do you find your scroll embellishments? Love these. I find them randomly online or create my own. This great! I love that you show us exactly what to use instead of just naming it - for those of us who have never done a sign it is a great help! And, that you make them to sell and share your craft! You are awesome! This is great! Thank you so much for the tutorial. I'm in the middle of trying to paint an initial on an old stool. I've painted the stool. Now I'm at the carbon paper step. In fact, I just painted my letter "K" the first time (I think I'll need another coat in there). It's a light gray color, so the carbon lines are showing around the edges. What do I do with these exactly? I read in the comments above that you use a good art eraser, and I will try that when it's all dry. But I'm guessing the carbon lines that are showing through a bit will just have to stay? How do you deal with this? Do you usually paint WITHIN your lines or OVER them? Also, have you ever used this method on fabric? Thanks so much for your help in this! I usually try to paint over the lines, so they don't show through. You may need to give it a few coats. I haven't tried the method on fabric, but I think it would probably work depending on the color and type of fabric. Good luck!! Next time, I will shoot to paint over the lines. I am making the Luke 2:11 sign that you made in 2011. When you paint the letters with a paint pen do you use the medium point? I am having a time with this and realized I had a fine point pen. I just don't know if I can use the paint brush...nervous about that. I really apprecaite any help you could give me. I typically use a fine point paint pen, however, for the Luke sign, I used a paint brush. For larger letters, I think a medium point would work better. Good luck with it! Just curious Amy, how do you ship your signs? We wrap them with foam bubble wrap, then several layers of cardboard and lots and lots of packing tape. Hi there, question: Do you wrap your signs in brown packaging paper over the cardboard? Love your tutorial, question about how you put the pieces of wood together? For example the I am my beloveds and my beloveds is mine. Do you use wood glue to attach each individual piece of wood, or did you find this piece already like this? Most of the time I use old doors, so the pieces are already together. Sometimes I will lay the boards together, then use thin strips of wood on the back and I'll screw each board into the wood strips. LOVE your work! How long did it take you to paint the lettering in the Luke 2:11 sign? Do you mostly use a paint brush or paint pen? Do you prefer a paint brush or paint pen? 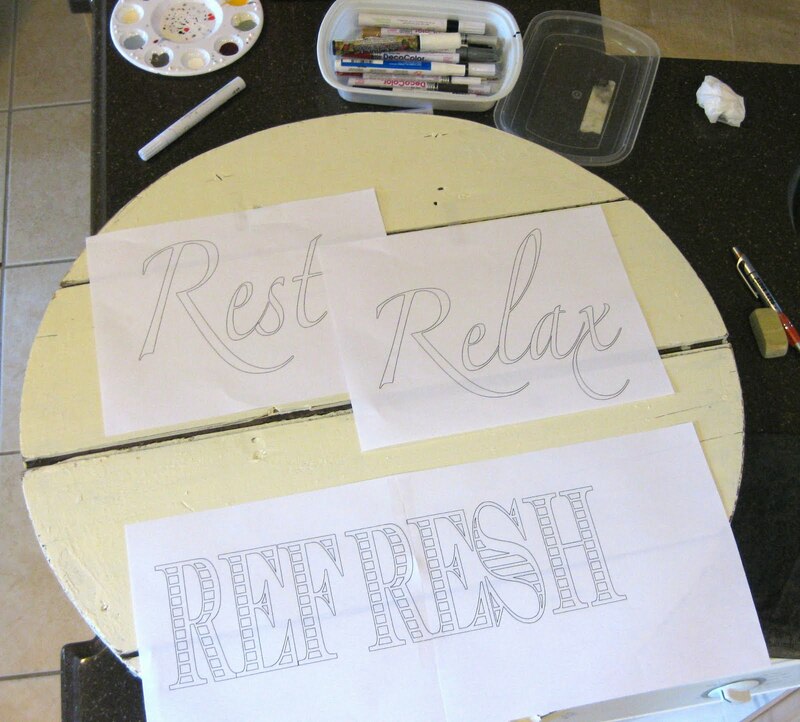 The length of time varies depending on the wood and amount of lettering needed. I'm not sure which sign you are referring. I mostly use a small brush, but sometimes will also use a paint pen. It depends on the project. I love your signs, they are so beautiful. Your "Love never fails" I Cor 13:7-8 is my favorite, can you tell me what fonts you used for this project? Thanks for sharing! The fonts I used were Times New Roman and Feel Script. I ship with UPS and because I've been shipping signs for a while, I've figured out how much it generally costs. Love Vicki and Virgil!! Hi Aimee! I love the feel script font you use but everywhere I look the cost is 99 dollars. Where did you get it if you don't mind me asking? Can you list a few of the other fonts you use as well? Love your work! and thank you for your time! Other fonts I use are Aquarelle, Lovers Quarrel, Loopi, Jellyka Delicious Cake, Respective. 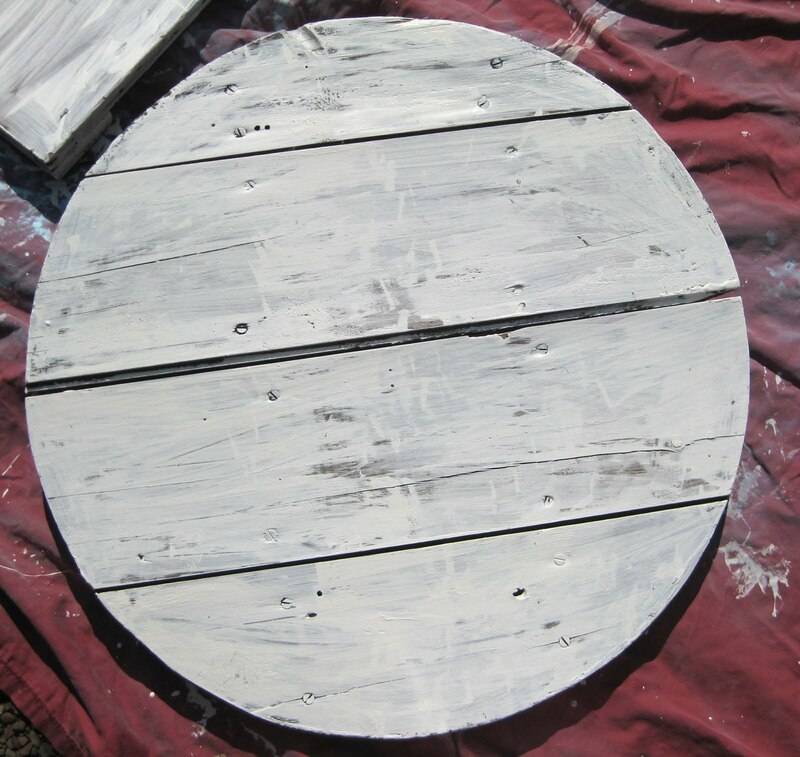 Can you tell me if you painted the wood white first and then added black paint for distressed, or black first and then white over and sanded off? thanks so much! I first painted the wood white, then sanded it. I didn't add any black paint - when I sanded off the white, it naturally was dark underneath. Interesting. You know, I think I was thinking more of your Zephaniah 3:17 sign. That shows so much more black and that is the look i am wanting. Was it the same thing though? When you sanded what showed through was dark wood? I think the lettering being black makes it look darker, I like that. My wood is much lighter, I may need to use some glazing after the white paint. If the wood underneath isn't dark enough when I sand off the paint, I will sometimes dilute dark brown paint with water, and brush it onto the raw edges, then wipe it off a bit. This makes the raw wood look darker. thanks, I'll try that. Right now I have spray painted black and put white over top and smearing. It is not quite the same, but a cool effect overall. Thanks for answering so quickly!! I am working on it right now and is very cool to run back in and see an answer!! First, thanks for posting the tutorial, your signs are lovely! I am wondering which paint pen you recommend? I'm in Australia and have been looking online at what we can get here - most of the pens are oil based and I am afriad it will clash with the words already painted with acrilyc. What do you think? Hi Scarlet! My favorite paint pens are the Sharpie brand and I've used both water and oil based. I'm not sure about the oil based clashing with acrylic. Sometimes the oil based ones are glossier, so it may not look quite right. Let me know if you have any other questions! Im from South Africa.. and absolutely love the wood signs!! Please will you let me know as soon as you get back online! Hi Lizzy! I use an ink pad that I rub on the canvas to darken the sides of the sign. I don't believe I had a tutorial for the "Beloved" sign, but the font I used was Scriptina Pro. Please let me know if you have any questions! The font is Times New Roman and Feel Script. If I'm planning on painting the wood signs, I'll use either a white primer first or I'll use a paint that has primer in it (saves me a step). 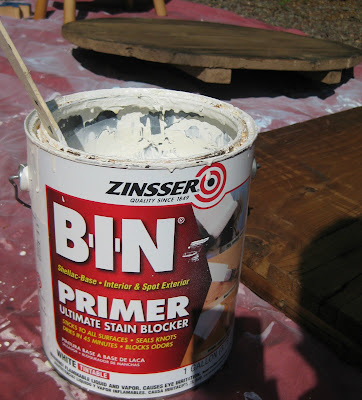 For the stained (brown) signs, I don't use primer or paint. I stain them with a Minwax stain that you wipe onto the wood. Let me know if you have any questions! Did you stain the wood or was it already that color? If it was stained, what color stain did you use? I love that color! I can't find any barn wood. So do you have any other suggestions on what type of wood to use? Is there something at Home Depot or Lowes I could purchase to make a sign? Thanks so much for this amazing tutorial! WOW !!!!! is it that much easy to make... can't believe now am gona try this one surely thanks for the great idea and .. nice creativity. Wow! This is amazing work! How much do your barn door signs weigh? Also, do you hang these on studs or will drywall hold them up? The signs typically weigh 15-25 lbs. and it's a good idea to hang them on studs, since they are fairly heavy. Aimee, I am wanting to make some signs but I can't get my letters big enough any suggestions? If you use MS Word, go to the "format font" box, then you can type in the size you want. How big of a font do you use? What a enjoyable tutorial i'll really go for it this weekend. AH-HA! 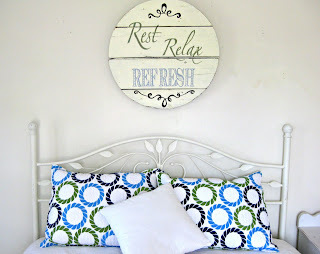 I've been looking for an easier way then completely free-handing or wasting all that vinyl! Thanks so much!!! You'll be able to see it on my newby blog soon! I'll be sure to mention you!!! Hello! I just love your blog and signs!! Thank you so much for posting the tutorial. 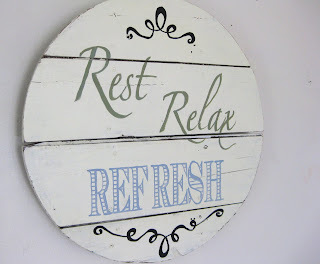 Right now I am using old barn wood for my signs. But I want to make a bigger/wider sign, like your "I am my Beloveds" sign. How did you secure the wood pieces together for that? That's where I am stuck. Thanks so much!! Thanks for your comment! You can secure the wood boards together with two thinner wood strips on the back going the opposite direction that you screw each board into. I hope this makes sense! Gotcha! Thanks so much! Wasn't sure if the secret was wood glue or what. But this makes total sense. Thanks Aimee!! Thanks for the tutorial! I am in the process of securing some weathered barn wood to make a couple of signs. The wood I am getting is the very light gray weathered - almost white although it isn't painted. One of the signs I will probably dry brush with red paint, but the other I was hoping to get the rich dark brown color you have on your unpainted signs. I know you have said in response to other comments that you use stain for this. 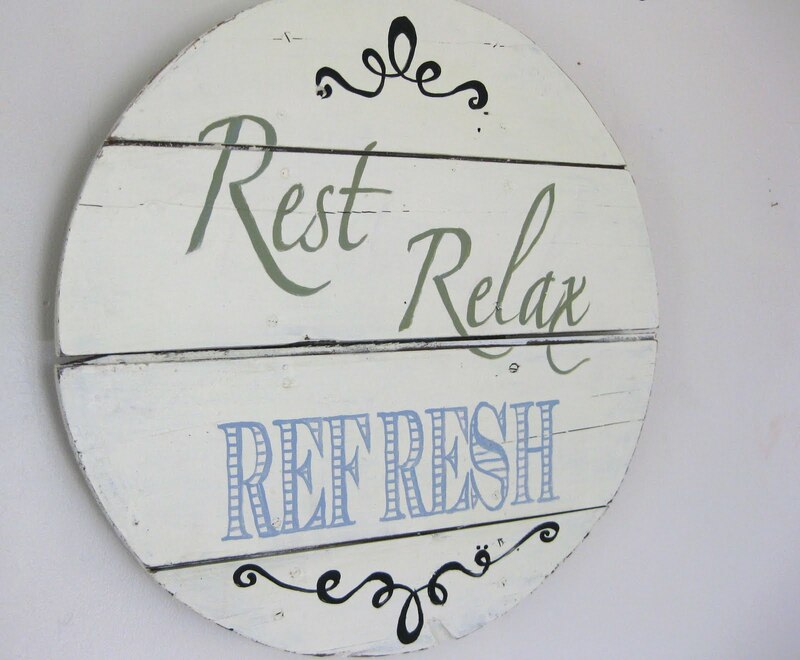 Do you think applying a dark walnut type stain directly to the light gray wood will produce the color of your signs? I'm leery about sanding them at all because I don't want the wood to look new! I'll also have to cut some boards to size. Do you do anything to distress the freshly cut edges to make them look more authentic or do you not really notice the clean cuts? I would sand the wood a bit if you want the wood to have a brown look. If you stain directly on gray, weathered wood, it typically gets very dark - almost black and doesn't have the rich brown stained look. We usually sand the edges of fresh cuts, so they look more authentic. I hope this helps! I'm having a hard time figuring out how to keep the lines of the wording straight. How do you accomplish this? Thank you so much for your help! Beautiful work and so inspiring!! Please share how to find the lovely scrolls you use. I've looked high and low for pretty scrolls and just can't seem to locate any I love, but yours are perfect! And I'd be ever so grateful for the link to find them. Thank you thank you!! I'm making a sign on old fence boards and I'm having a hard time transferring the lettering using graphite paper have you ever had this problem? If so, did you come up with a solution! I use white graphite paper when tracing onto a darker surface. Maybe using that would help? You can find it for sale at www.dickblick.com. I have used a projector on rougher surfaces. Might be an option for you. I found a used projector for $5 at our school surplus store. Thank you so much for posting a tutorial. There have been other artists that I've wondered how they did things but they would only say very vague statements saying it was trial and error. I like that you shared this. Is the only way to get the Feel script font is to pay $99?? I just wanted to tell you thank you for posting such a wonderful tutorial. I was able to make a beautiful sign for my new baby boys room and just love admiring it. I super appreciate your detailed explanation and all of your follow up comments. Hi, I am in love with your signs, and wanted to make some for my upcoming wedding in February. But I am having a problem. I have tried to use a stencil, and taped it down so it didnt move and the pain keeps bleeding. I want to keep the wood natural.. Any suggestions? Please help! I don't use stencils for my signs, so I'm afraid I can't give you advice on this. I use carbon paper to trace the lettering, then I paint it. Your signs are so beautiful! I absolutely love them! I want to try to make one from some barn doors we have. I love the color stain you use on the brownish signs. What color stain is that? It is Minwax Dark Walnut. Aimee what kind of hardware do you use to hang your creations? I LOVE your work. Absolutely beautiful. We use heavy duty picture hanging wire or large sawtooth hangers. Thanks so much for sharing, I found all the comments and answers you gave very helpful as well! Thanks for shearing this with us this is really a very nice post. I tried to download the Feel Script font and it is $99. is the the same font you used- where did you find it?! What did you use to make the squiggly's above and below the letters? I free-handed the squiggles on the sign! Sign Tutorial is one of the best article. i like this post. Great job with your site. Fantastic idea's, great work! Wow every Sorority Paddle look beautifully hand crafted. They can be used to Decoration and other creativity. Thanks for this post! This was really helpful to me. Keep up the great work here! Do you have any tips of how to get the craft paint thick or go go on smooth. 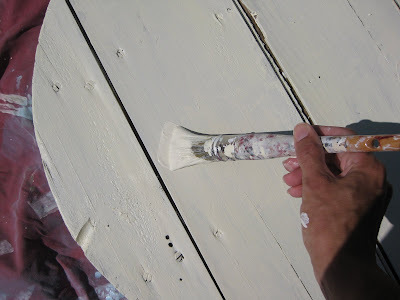 when I use it (white paint on dark wood) I have to do many coats and it still shows streak make of the painting. The board noted that it is not immediately clear what the advertisement is for and that there is no obvious link between the advertised image and the advertiser’s services and considered that the advertisement did present violence in a manner which is not justifiable in the context of the product or service advertised,” said the Ad Standards Board.Signco Brisbane did not respond to the initial complaint, but advised the board the ad had been removed upon its ruling. SmartCompany contacted Signco but did not receive a response prior to publication. Here are options for Sign writing, Online Signs, Banners, Vehicle Signs, Building Signs, Shop signs, Business signs, Corporate window frosting , Sticker Printing, Pull up banners, Poster printing, Signage, Perth, Australia and digital printers. Sign makers play an important role in making advertising successful. Using signs and banners is a common method of advertising. These are quite helpful in attracting customers and spreading the brand name of the company. Custom Yard Signs Printing Services - Yard signs are good way to use for everything from real estate to yard sales to political signs. A lot of on-line sign companies provide long-lasting signs you can create and buy on the Internet. We offer yard signs and their customization services in USA at cheap price. Hello and thank you for your tutorial. In regards to the fonts that you said were free to download; the Sccriptina and the Ecuyer Dax. When I go to download the Scriptina I notice it says "100% free" but when I go to the Ecuyer Dax it says "free for personal use". Does this mean that I can not use that font if I want to make my signs and try to sell them? Thank you! ..but I can't get my letters to show up on the board? I got the carbon paper you recommend and I'm pushing hard, but I don't have a pretty dark outline like you do :/ I can barely even see it. Argg. Pull up banners are the ideal way to quickly erect a temporary or semi-permanent advertising display for your product or service. Use pull up banner printing at events and trade shows, or even within your office space to cheaply and non-intrusively add some branding to your space. You shared a fantastic tutorial that will be useful for everyone, even for beginners. Thanks a lot! You actually make it seem so easy with your presentation but I find this matter to be actually spirulina plus tablet something that I think I would never understand. It seems too complex and extremely broad for me.